If you were pursuing a degree in nursing, would you accept an offer of $8,530 in exchange for paying 14% of your income for 118 months after graduation? That is what Jario Sneider did. Often, students must make college decisions based on their financial circumstance. Masters and doctorate degrees are frequently ruled out due to a student’s already hefty undergraduate loans. A new system of investment, human capital contracts, could reduce the stress of student loans and create an environment where students can pursue higher degrees without a huge financial burden. Under human capital contracts, students enter into a contract with a source of funding (a corporation or a wealthy individual) who will pay for some of their expenses. In return, the student pays a fixed percentage of their income after graduation for a set time. These contracts sound like indentured servitude to some, where the lender gets a cut of the borrower’s labor for a certain period of time. The contracts are more effective in predictable or profitable career fields. For example, people would be much more willing to invest in an Engineering degree than, say, an English degree. High-earning graduates may not join, because they will end up paying a larger amount of money in the long run. Student debt is no longer an issue. Instead of having to pay a certain amount of money, the student pays a certain percentage of income, always leaving a high percentage of income in their bank account. There is a limited repayment term. The students will know exactly when their deal is up, which creates less stress for the student. Payments are based on income. This proportional payment is much less crippling than the typical student loan. There are also risks on both sides of this contract. The student risks paying more money than they would with a traditional student loan. The financer risks investing more than the student will pay back. However, in most instances, students will end up paying about the same amount of money in human capital contracts as they would with traditional student loans. In my opinion, the benefits outweigh the costs. 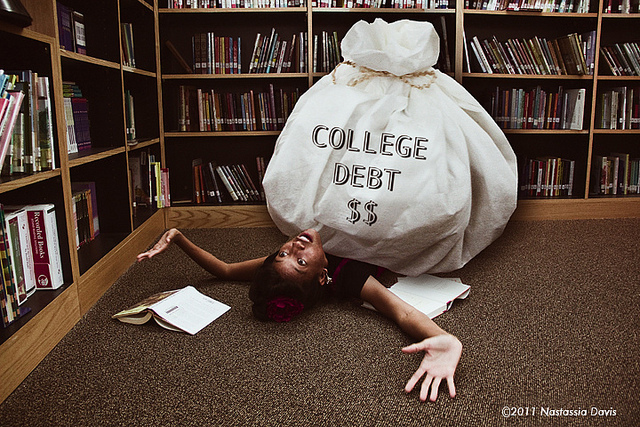 Students do not need to worry about a crippling debt when leaving college. The stress of paying off loans for the rest of the student’s life is gone and students will always have a part of their income to spend. While, yes, this may predominately benefit those students who are pursuing degrees in more profitable and stable fields, it is an opportunity to free up more federal funds for those pursuing other areas of study. Interested? Check out Upstart, a site that allows students to create a profile to attract investors. The website will verify the education and credentials of a student before the profile is posted, allowing investors to have confidence in their “upstart.” Upstart will create an acceptable income percentage based on your degree and background and enforce payments on both ends. Currently, Oregon is trying to pass a bill that would regulate this idea throughout the state. The bill, named Pay it Forward, instructs the state’s Higher Education Coordinating Commission to come up with something similar to human capital contracts. Students would not pay up front costs to attend college. Instead, they would pay a fixed percent of their income after leaving college for a certain period of time, just like human capital contracts. The bill is expected to be signed by the governor soon. This could be a stepping stone for a federal law, or just an expansion of this idea. The human capital contract is an idea that is not likely to take hold anytime soon. Many advocate for a government sponsored system, which would implement penalties if either the sponsor or the student reneged on their agreement. But, many argue that a government sponsored program would create tension about taxes and government regulation. For now, human capital contracts take place in small-scale, private businesses which very few students pursue. If the government or private businesses find a way for these contracts to be enforced, they could become the future for students who want to avoid crippling debt. Tags: Education, Human capital contracts, Student, Student debt, Student loan. Bookmark the permalink.